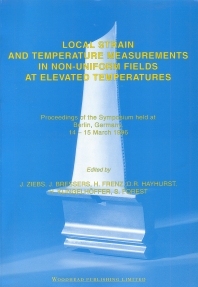 The proceedings of a symposium held in Berlin in March 1996, drawing together practical expertise in measurement techniques, with typical applications ranging from in situ measurements of strain and rotation on small specimens through notched specimens and single crystal up to turbine blade shaped samples and full scale component testing. The symposium also highlighted new techniques such as speckle interferometry and image analysis. Session A State of the art and development trends in local stral n measurements; Session B Local temperature control and measurement; Session C Link between speclmenlcomponent testing and computer simulation of speclmenlcomponent behaviour; Session D Areas of standardization and need for future research.